In early 2014 the Karnataka Medical Council initiated a move to enforce the renewal of registrations of medical practitioners. It stipulated a 5 year term and 30 CME credit points for such renewals. Many medical professionals and organisations had questioned the legal basis for this plan, but instead of providing any convincing answers, KMC went ahead, and on April 20, 2016, announced the schedule for renewals. Many documents have since appeared in the public domain, which prove beyond any doubt the lack of legal basis for such CME linked renewal. Although KMC started awarding CME Credit points from early 2014, it appears to have discussed about it much later, in July 2015! And wrote to the Govt., seeking legal mandate even later, in November 2015! But until now, nothing has moved ahead and the process lacks any legal basis. 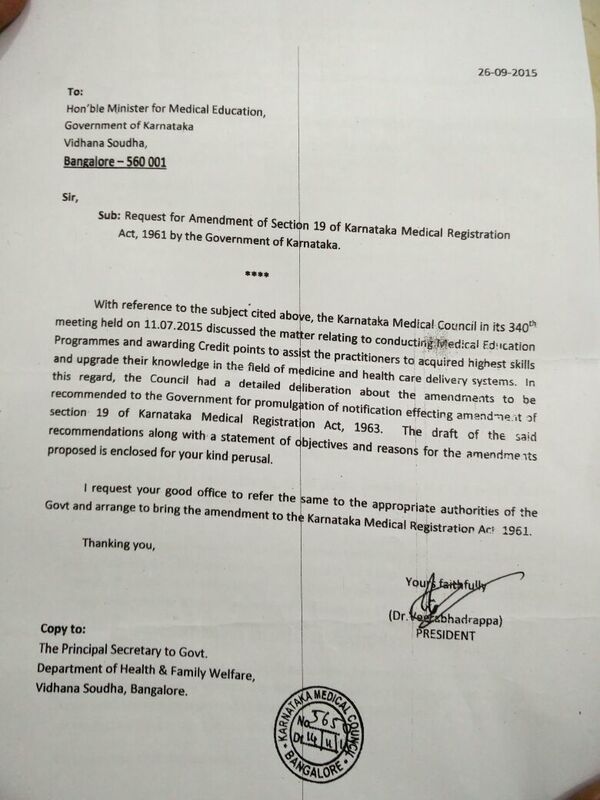 This letter by the President of KMC to the Minister of Medical Education (dated 26 September 2015, sent on Nov 14, 2015), was accompanied by a draft of amendments that KMC wanted the Govt., to enact. Although the Govt., has so far put it aside and not even considered to take it up, these proposed amendments are so draconian and dangerous, that if enacted, all the medical practitioners of Karnataka will cease to be practitioners! The draft of the amendment states that the medical practitioner who fails to renew as per the rule ‘shall cease to be a registered practitioner’ and that his name will be removed. Note that the prevailing Section 43 of KMR Rules 1963 has no such clause at all; it merely states that each Medical Practitioner registered under the Act shall apply to the Medical Council well in time with a renewal fee of rupees two paid on or before the 31st day of December of every year for the continuance of his name in the register. The Section 19 (2) of the KMR Act, on the other, only states that ‘if the renewal fee is not paid before the due date, the Registrar shall remove the name of the defaulter from the register, provided that the name so removed may be re-entered in the register on payment of the renewal fee in such manner and subject to such conditions, as may be prescribed by rules. The vastly different tone and tenor must give us a lot of insight! If the draft proposed by the present members of KMC is allowed to be enacted, the practitioners who for any reason fail to follow the diktats of these draconian rules would cease to be medical practitioners! Further, the draft seeks to define CME as the programme approved or conducted by KMC. Thus, any other programme, conducted by others and not approved by KMC, will cease to be a CME and practitioners attending such CMEs will be deprived of any credit. These proposals also raise suspicions about the plans to erect a grand CME Enterprise. The draft also suggests that the President and members of KMC will have the powers to waive off CME credits in ‘special cases’. We leave it to your imagination to interpret. The clause also seeks powers to KMC to make amends on its own. This is against the Sections 31 and 32 of KMR Act that vests such powers only with the state legislature, that too in session for consecutive 30 days. Any dilution of such provisions that safeguard the interests of medical fraternity and any attempt to provide unchecked powers to the medical council may have dangerous consequences. The Govt., has so far not considered these amendments and hopefully, will not do so in future. Furthermore, the draft suggests amendments to Section 43 of KMR Rules of 1963 and not to KMR Act of 1961 (amended in 2003). The KMR Rules are meant to help the implementation of the KMR Act and therefore must concur with the KMR Act. Accordingly, in the existing KMR Act 1961 [Section 19 ] and KMR Rules of 1963 [Section 43 ], the words are similar and state that one should apply with ‘a renewal fee of rupees two paid on or before the 31st day of December of every year for the continuance of his name in the register.’ The proposed amendments to Section 43 in the new draft DO NOT concur with section 19 of KMC Act as amended in 2003! Further, the proposals also run contrary to the letter and spirit of the IMC Act 1956. Let’s wake up before it is too late, let’s stop this draconian and dangerous amendment right now! Renewal Skeptics: Why Renewal with CME Credits?